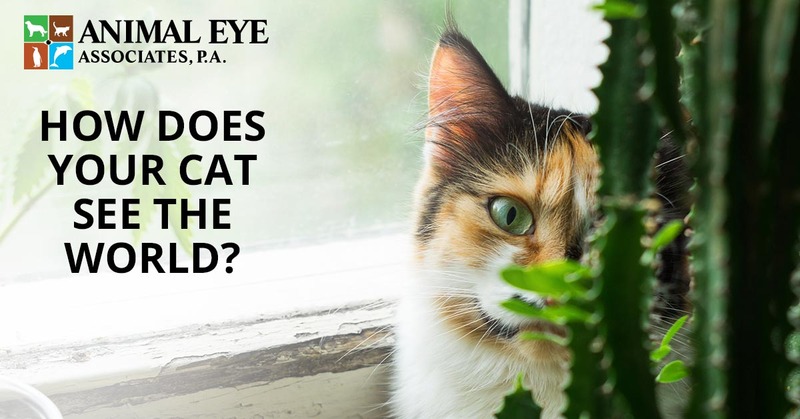 Eye Care For Animals Orlando: How Does Your Cat See the World? 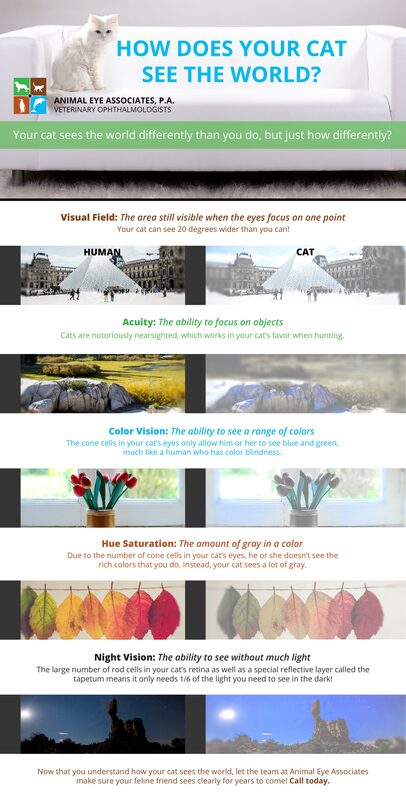 How Does Your Cat See the World? Humans are primarily visual creatures, and it can be odd to think of using our noses or ears instead. Cats experience the world through all their senses, but their eyes aren’t primary. Eyes are more like extremely important support. Today, we want to go over just what your cat sees! As we said on our page about animal vision, eyes can only see as much as they’re positioned to see. Humans share binocular vision with cats and dogs, but there are many differences amongst us all. While dogs’ eyes sometimes tend to be placed on the sides of their heads, cats’ eyes face front like human eyes do. Cats have 20 degrees more peripheral vision than humans do, which is perfect for staying aware of their surroundings. They identify things by motion, so the ability to spot movement is very important. We have to put on special goggles to see at night, but cats don’t. It’s a good thing, too. They evolved to hunt at night. Their eyes have to let in lots of light, which means their pupils can dilate far beyond what ours can. If you’ve ever seen your cat’s eyes fully dilated, you understand how extreme the dilation can get. Their eyes become all pupil! Dilation isn’t the only advantage that cats have over humans at night. Their eyes actually capture and build up light within their eyes by bouncing it against a reflective layer under the retina. This layer is called the “tapetum,” and it’s responsible for the eerie flash/glow of cats’ eyes in the dark. If you want to see color, you’ve got to have cone cells in your retina. Because cats have a mere fifth the cone cells humans do, they mostly see in black and white. They can also see blue and yellow, but they don’t see saturated colors. As we said before, they depend on movement and contrast to identify objects. This term refers to the ability to focus, and humans totally beat cats here. Cats have about 20-40 percent of the visual acuity we do, which means they cannot depend on their vision the same way we do. Cats are quite nearsighted, which works when they’re hunting down prey. Again, it’s good that they can smell and hear so well. They can lean on those two senses and use vision to confirm what they already know they’re smelling or hearing. Though many animals depend on senses other than vision to experience the world, vision still plays a very important role in their quality of life. When they have trouble seeing, it can lead to injuries and danger. At Animal Eye Associates, we work hard so we can ensure your animal friend’s eyes fulfill their role. We have experience with an extremely diverse range of animals, and we’re passionate about what we do. If your pet is having trouble seeing, contact us and let our animal eye care professionals help! We provide eye care for animals in offices in Orlando and Maitland.